Scuffle broke out on a Southern California beach where Trump supporters were marching when counter-protesters doused organizers with pepper spray. 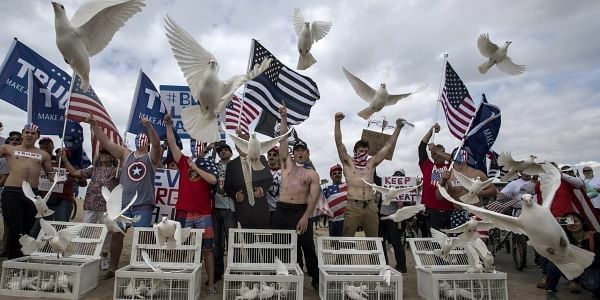 HUNTINGTON BEACH: A scuffle broke out on a Southern California beach where supporters of President Donald Trump were marching when counter-protesters doused organizers with pepper spray, authorities said Saturday. Two people suffered minor injuries that didn't require medical attention, Pearsall said. An anti-Trump protester who allegedly used the eye irritant was kicked and punched in the sand by a group of Trump supporters, the Los Angeles Times reported (goo.gl/3C88wT). Counter-protesters said before the march began that they planned to try to stop the march's progress with a "human wall."